Believe it or not, this place actually doesn’t put fig in all of their dishes, like the name may imply. However, they do put locally grown organic produce in all of their dishes. Karen Small, the owner and Executive Chef opened The Flying Fig in 1999 and has always made sustainable agriculture a priority both in her restaurant and in her life. 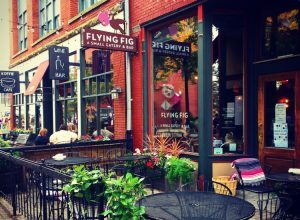 Located in the heart of the wildly popular Ohio City neighborhood, The Flying Fig is the perfect little trendy addition to the area. It definitely has a hipster feel despite being around for nearly ten years. The interior is modern and beautiful. 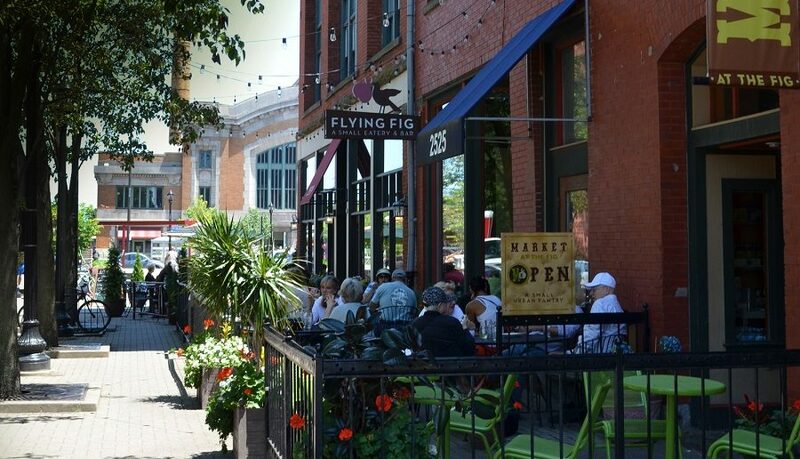 The outside is just as nice – it has a small section of outdoor seating that overlooks the street and the West Side Market. It’s the perfect spot to end a relaxing summer day. The menu is full of great dishes for brunch, lunch and dinner. While the lunch menu is good, the light really shines on the dinner and brunch menus. 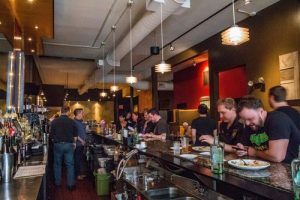 They have great offerings for everyone – vegan, gluten-free and vegetarian options that will be sure to please. 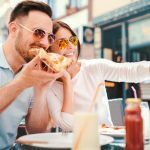 The brunch menu has fair amount of breakfast and lunch foods, so no matter what time of day (or what meal you’re craving) you’ll have the perfect list to pick from. The prices range from $3 to $15. Regulars love the “House Cured Ham Benedict” (toasted biscuit, braised greens, poached eggs and house hot sauce hollandaise) for $14, the “Ohio Brunch Burger” (bacon, cheddar, mustard aioli, onion ring, house pickles and fries) for $15 and the “Chicken Enchiladas” (confit chicken, refried beans, sautéed veg and fried eggs) for $13. The dinner menu encompasses most of the lunch menu plus some extra standouts including the “Pan Roasted Bronzini” (warm fingerling potatoes, garlic aioli, roasted peppers, oil cured olives, arugula and fennel) for $28, the “Tofu Banh Mi Bowl” (hoison glazed tofu, shredded veg, avocado, radish coconut jasmine rice, cilantro and peanut sambal) for $18 and the “Tagliatelle Bolognese” (Ohio beef & pork ragout and minted ricotta) for $22. The main dinner menu ranges from $15 to $28. In addition to all of this, they have great Happy Hour specials that run every week. The deal applies to their sandwiches and draft beer and is available Monday 3 pm to 9 pm, Wednesday-Friday from 3 pm to 6:30 pm and Sunday from 3 pm to 9 pm. One downside of The Fig, is the unusual hours of operation. They are open Monday from 3 pm – 9 pm, Closed Tuesday, open for lunch Wednesday and Thursday 11 am – 3 pm and dinner from 5 pm – 10 pm, open Friday and Saturday for lunch from 11 am – 3 pm, dinner 5 pm – 11 pm, and 11 am – 3p for lunch and brunch on Sunday. Stop in at the Ohio City location at 2523 Market Ave Cleveland, OH 44113. Contact the restaurant via phone at: (216) 241-4243.